The USD/CAD remained capped in a tight range of 100 pips at 1.3220-1.3320 as oil price correction higher stopped. Canada’s December inflation accelerated unexpectedly to 2.0% over the year with core inflation measure up 1.7% at the same time. Only minor economic data are scheduled for both Canada and the US with the technical picture favoring continuation of a sideways trend. FXStreet Forecast Poll turned stable with the forecast price for USD/CAD moving within 160 pips range for 3-months ahead. The USD/CAD remained trapped in a very tight range of about 100 pips ranging from 1.3220 to 1.3320 during the consolidation phase of the third week of January. The USD/CAD is moving within a sideways trend after a flash-crash from the beginning of 2019 that saw the pair rising to 1.4134. With the oil prices also remaining in a tight range of one US Dollar, the commodity market did not provide a reason for the Canadian Dollar to be boosted. It was the release of Canada’s inflation in December that boosted CAD on Friday with the headline inflation surprisingly jumping back to 2% Bank of Canada's targeted level. The upward price pressure to transportation and travel related components overshadowed the oil price drop in December that saw gasoline prices fall. This is adding a reason for the Bank of Canada to act on rates as the Bank indicated in January that despite the drop in oil prices and inflation, it is still firmly on track to monetary policy tightening towards the neutral level of 2.5%-3.5%. “Inflation is projected to edge further down and be below 2% through much of 2019, owing mainly to lower gasoline prices,” the Bank of Canada wrote in its last monetary policy decision on January 9. On the other hand, the Bank of Canada is expecting depreciation of the Canadian Dollar to have pro-inflationary impulse largely negating the oil price development. “Lower level of the Canadian dollar will exert some upward pressure on inflation. 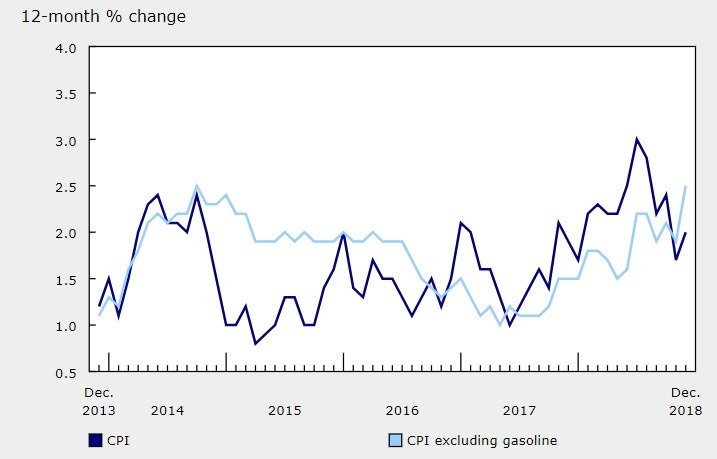 As these transitory effects unwind and excess capacity is absorbed, inflation will return to around the 2% target by late 2019,” the Bank of Canada further stated. The upcoming week will see Canada’s retail sales expectedly dropping by -0.5% over the month in November. The upcoming week is set to remain driven by the further direction of oil prices and the monetary policy comments, especially from the Federal Reserve officials, although there is no important speech scheduled. The technical picture indicates continuous sideways trend framed by a 50-day moving average of 1.3200 and a 100-day moving average of 1.3370 with the technical oscillators depressed in the Oversold territory. Technically, the USD/CAD is moving within a sideways trend after slumping from the flash-crash high of 1.4134. The USD/CAD is facing support at 1.3200 representing a confluence of a 50-day moving average on a daily chart and a 50% Fibonacci retracement of the upmove from last year’s low of 1.2260 to 1.4134 high. The technical oscillators are depressed after the USD/CAD made a correction from the highs, with sideways trend framed by a 50-day moving average of 1.3200 and a 100-day moving average of 1.3370 with the technical oscillators depressed in the Oversold territory. Canada’s economic calendar highlights the retail sales report on Wednesday, January 23 with the retail sales seen falling -0.5% over the month in November. The FXStreet Forecast Poll is short-term bullish with the spot rate of USD/CAD expected at 1.3265 in the 1-week horizon, up from 1.3240 the FX spot rate on Friday evening in Barcelona. The majority of forecasters see US Dollar rising (47%) compared with 33% of bearish and 20% of sideways projections. The FXStreet Forecast Poll is slightly bearish for the 1-month ahead with USD/CAD seen reaching 1.3220, and 42% of bearish to 21% bullish predictions. The sideways trend prediction actually reaches 37% for the one month period. The three months' forecast reflects rising Brexit uncertainty with average FX rate for USD/CAD seen at 1.2188. Bullish forecasts reached 34% and bearish projections reached 47%. The sideways trend was predicted by 19% of forecasts.